This is Barcelona City Council's local development agency and it implements the city's economic promotion policies. The School for Women Entrepreneurs has over twenty years of experience in supporting women entrepreneurs, offering advice, professional training and networking opportunities. As a business platform, 4 Years From Now (4YFN) creates connections between start-ups, investors and companies. A meeting point where brands, citizens and administrations establish a dialogue to add value to understanding the business world from a sustainable perspective. This is a Barcelona City Council-driven initiative to promote the city's economic development. According to Airports Council International it is the best airport in Europe, with 35 million passengers a year, only 12 kilometres from the city centre and 3 kilometres from the port. This is the biggest port in the Mediterranean in terms of the volume of goods handled. It is also Europe's leading port for cruise traffic and the fourth most important base port in the world. The high-speed train line links Barcelona with the European network and the main Spanish cities. Thanks to its long business and commercial tradition, Barcelona is today one of the most important cities in Europe for doing business. The city produces and attracts entrepreneurs and is establishing itself as a European centre for business creation. The local authority promotes economic activity by establishing a stable, business-friendly framework that encourages economic growth. Another noticeable feature is the creation of business clusters in cutting-edge sectors such as information and communication technologies (ICT), the media, biotechnology, energy, design, social sciences, aeronautics, aerospace and mobility. Barcelona offers many competitive advantages and business opportunities in the logistics and distribution sectors. The city's international positioning is a very important factor in strengthening its capacity to attract companies, jobs, talent and foreign investment. 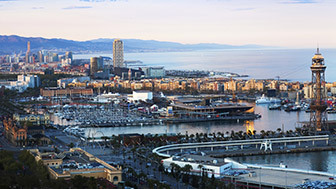 Barcelona is the world's leading city in terms of the number of trade fair and conference delegates it attracts. Barcelona is ranked seventh in the world in terms of the number of trade fairs and conferences it holds. Barcelona heads up a large economic area with a long industrial tradition and a solid business framework. The professional and business opportunities available, and the excellent quality of life, help to keep local and foreign talent. The Mobile World Congress has turned Barcelona into the global capital of new technologies. Barcelona is strengthening its broad range of strategic activities with new initiatives that lead to international collaboration and leadership. The ZAL is Port of Barcelona's intermodal logistics platform. It provides logistics infrastructure services for goods transport. The BCL's goal is to establish Barcelona and Catalonia as the big logistics hub in southern Europe. This international trade fair is held at the Fira de Barcelona. It is considered to be the most important in Spain, the Mediterranean and southern Europe. The consortium's goal is to drive the economic development of Barcelona and Catalonia. Barcelona Air Routes Development Committee (CDRA) aims to promote the development of new intercontinental routes from Barcelona Airport. The Barcelona Chamber of Commerce is responsible for ensuring the promotion of economic and business activities and the sustainable development of the Barcelona area. 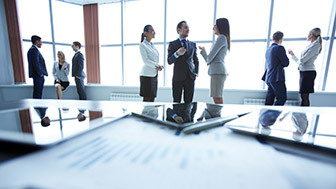 The Business Support Office offers a comprehensive and free one-stop-shop support service to accompany Barcelona-based investment projects from businesses and entrepreneurs operating abroad. Search engine for available business spaces in Barcelona where you can look for available commercial premises, offices, business centres, industrial buildings and unoccupied industrial land to buy or rent. 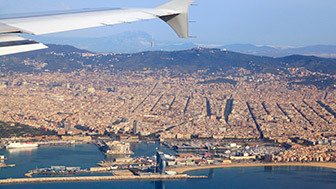 Barcelona, the gateway to southern Europe, is the connection point with Europe, a huge economic area of over 700 million inhabitants. There are more than 33,000 companies in Barcelona that specialise in logistical operations and goods transport, importers, exporters and international operators. Barcelona also has a high-speed train line that connects it with the European network and the main Spanish cities, plus a motorway system linked to Europe, which means it is two hours from France by road and a day from Europe's main capitals. With a long industrial tradition behind it and a large business community, the city is geared towards the economy and knowledge-intensive activities, especially advanced services and new economic activities. Sectors linked to new technologies and sustainability, which offer considerable business and investment opportunities, are developing strongly in the Catalan capital. For the last 14 years it has been seen as the best city in Europe in terms of the quality of life enjoyed by employees, according to the “European Cities Monitor”, and it is the only southern European city that concentrates, in a five kilometre stretch, one of the Mediterranean's biggest ports, a high-speed train station, an international airport, motorways linked to the European network, the second largest trade fair site in Europe and one of the biggest logistics zones in southern Europe. Most foreign investment in Catalonia is concentrated in Barcelona, the sixth best city in the world for business. The quality of life and skills of its human capital are two of the things valued most highly by the foreign companies that have moved into the city, as well as by various international rankings. The city is constantly trying to improve go for to projects with big opportunities for the future. Consequently it is permanently immersed in large-scale urban redevelopment, which requires a lot of public investment and offers big opportunities for private initiative. Various independent, international and comparative studies back Barcelona, an internationally renowned city that enjoys a deserved prestige, as a city to invest and do business in.